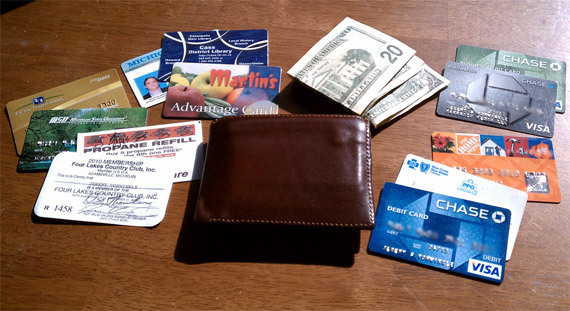 People seem to have a curious fascination with what other people carry in their wallet or purse, and various personal finance memes have gone around highlighting what bloggers carry in their wallets. Well, even though I’ve been doing this for over four years now, I realized I haven’t taken part in any of them. So, I asked a few of my Money Writer blogging friends to join with me in taking a snapshot of their wallet contents and spending a few minutes explaining what they have in there and why. If anything, it can get a little too serious around here. 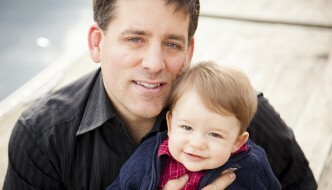 We cover topics such as retirement, digging out of debt, frugal living, and even college savings. So, it’s time to lighten the mood and have some fun peeking into the wallets of some real bloggers. So, let’s get started. We will kick things off with my very own wallet before making the rounds and taking a peek at some of the others. Let’s start with the obvious. My wallet isn’t anything fancy and it’s just a simple bi-fold. To be honest, I don’t even know if it has a brand name because I can’t find any logos or writing inside anywhere that would say so. I received it as a gift a few years ago and since it matched my brown dress shoes perfectly, I decided to keep it. Although, it is kind of funny that I don’t have a regular job and a need to wear dress shoes any longer, but that’s a post for another day. I know, not that exciting, right? Be that as it may, I’ll take this opportunity to briefly explain everything. Country Club Membership - As fancy as this sounds, it’s really not. There is a semi-private golf club a few miles away and I decided I wanted to get more golf in this year since I was now working exclusively out of the house. Golf can get expensive, so I looked into various membership opportunities in the area. Well, I found this course about 5 minutes away that had a somewhat outdated website and it listed a “junior” membership (age 35 and under) for just $500 a year (50% off a regular membership). So, I printed off the page and took it with me to the course and asked if I could get that rate. They said that was dated and they no longer offer it, but after insisting, the manager made some calls and said he would grant me that rate for 2010, but couldn’t offer it beyond that. I didn’t mind, so I paid up and golfed a ton early in the year to get far more than my money’s worth. Needless to say, I won’t be paying full price next year, but it was nice to get some cheap practice time in! Propane Card – I use a lot of propane. There are two reasons for this: I grill almost every night during the summer and I use propane to power my burners for home brewing beer. Obviously, it makes sense to get the equivelent of a rewards program when you use so much gas, so that’s what I did. I refill my tanks at the local Ace Hardware and for every 5 tanks you fill, you get one filled for free. As you can see, I have all five marks checked off so that card is as good as $15 sitting in my wallet! Fifth Third and College Visa Cards – To be honest, these cards don’t get much action. Neither of the cards offer any sort of rewards program or cash back so they aren’t used for daily purchases. Instead, these are the two cards I have with the longest credit history. One dates back to the 1990s, so it’s important to keep these cards active and in good standing. Maybe one a month or two I’ll pull one of them out to make a small purchase just so I can keep them from getting closed due to inactivity. Driver’s License and Library Card – I don’t think these need much of an explanation. The license is mandatory, but I keep a library card on me for the occasional trip to the local branch. Living in a very small town (population under 1,500) the book selection is limited, but most books can be requested. Grocery Card – There is a regional grocery chain around here called Martin’s and they are great. There’s a huge new supermarket not far from our house and they sell a lot of great local meat and produce, so it can’t be beat. Even better, if you use their “Advantage Card” you rack up points that can go towards saving on gas at a few of their stores that offer gasoline. So, I usually fill up at their station and most weeks I have racked up anywhere from 10 to 15 cents off per gallon. Then when you pay for the gas with a rewards card it’s just that much sweeter! In addition to gas discounts, if you buy baby products there you’ll also occasionally get coupons for a few dollars off on diapers and baby wipes and such. That comes in handy when you have two kids under 2. Cash - I know a lot of people are going completely cashless these days, but that’s something I can’t quite bring myself to. For one, you just never know when you’re going to need a few bucks, want to give to a spontaneous charity on the street, etc. Second, I absolutely hate using credit or debit for small purchases (under 5 dollars). Especially around here, we have almost nothing but small independent businesses, and if they accept debit/credit at all, I don’t want to stick them with the processing fees for a small purchase. Their profit margins are small enough, so I don’t need to be hurting the business owners in my community any more, so I always try to use cash when I can. In this case I had $23 in my wallet, but I almost always try to keep between 10 and 30 dollars on-hand. Business Cards â’ Here I have two Chase business cards. One is credit and one is debit. Frankly, I don’t use the business debit card, so that one should just be pulled. The Visa earns rewards, but I don’t have many expenses, so it doesn’t amount to much. Home Depot Card – Iâm not usually a big fan of store credit cards, but I couldnât pass this one up. When we moved into a new house late last year it became apparent this spring that our lawn was far too large for my $100 push-mower. So, I set out to find a reasonable riding mower. Back in March I saw Home Depot had the John Deere line of mowers available and as part of the special, they threw in a $200 dumping pull cart and had 12-months of zero interest and no payments. So, rather than take up space on an existing card or pull $1,500 out of savings, I went for the no-interest deal and charged it to the card. Since then Iâve just been making $125 monthly payments so that itâs paid off in time and no interest will be charged. Chase Debit – I know, I skipped over the insurance card, but what is there to know about that? Anyway, the last and most frequently used card in my wallet is this one. Itâs my chase rewards debit card. Whether bills or groceries, this card sees almost all of the action. I know some might wonder why we donât use a credit card instead, but the simple answer is just that we donât like to. As long as they aren’t online purchases, we’d rather have things come right out of the checking account. Besides, last year we racked up nearly $500 in rewards. What’s In the Other Money Writers’ Wallets? The "cold hard cash" is much warmer and softer than credit cards. Besides the cards and cash, I also carry all my loyalty program cards. (buy 10 and get 1 free types) I also carry important business cards as well. $500 in rewards? Geez we definitely need to join. Any particular place you earned the most rewards? I use a binder clip to hold my badge(work), Drivers Licenses, and bank card. Aside from the usual, I also carry one of my boss's business cards, my doctor's information, my next of kin's contact information and list of any medications or supplements I'm taking.